Thousands of U.S. women religious have just staked their public credibility in the cause of health care reform, during one of the most polarized civic debates in decades. These women with a vow of poverty had riches to spend: public trust accumulated since the Middle Ages, when European orders of women and men risked their lives to treat victims of the plague. Later, congregations like the Daughters of Charity and the Sisters of Mercy built hospitals in the United States to serve the poor, refugees and immigrants. Catholic sisters tended the wounded during the Civil War and nursed the pioneers—all for the love of Christ at pittance wages. Gradually, they built the largest number of not-for-profit health facilities in the nation: an extensive network of clinics, hospitals, home health programs and facilities for assisted living, long-term and hospice care. The Catholic Health Association of the United States currently represents 600 Catholic hospitals and 1,400 nursing homes. The Catholic Health Association, whose membership is made up largely of religious congregations of women and their institutions, exercised substantial leverage in the recent health care debate. Carol Keehan, D.C., as president and chief executive officer, expressed the association’s position with civility and candor. “We urge Congress to continue its work toward the goal of health reform that protects life at all stages, while expanding coverage to the greatest possible number of people in our country,” she said in January. As Congress prepared to vote on the final bill, the C.H.A. was joined in its support of the reform by the heads of the Leadership Conference of Women Religious and more than four dozen U.S. congregations of women. The sisters entered the fray burdened, like an athlete at the Olympics with family problems on her mind. First, their communities have been the focus of an ongoing Vatican investigation, the purpose of which has never been fully explained. That troubling circumstance alone might have paralyzed less committed advocates. Second, toward the end of the legislative process, the sisters found themselves holding a different view from that of the U.S. Catholic bishops on a matter of prudential judgment concerning possible loopholes for federal funding of abortion resulting from the bill. Although some opponents publicly dismissed the sisters’ view, the women religious in health ministry have earned special standing on this issue. They built the hospitals, tended the sick, midwifed the newborns, sat with the suffering and calmed the dying. As for the sisters in other ministries, they wrote to Congress: “We have counseled and prayed with men, women and children who have been denied health care coverage by insurance companies. We have witnessed early and avoidable deaths because of delayed medical treatment.” The sisters demonstrated leadership of a high order. The church’s credibility in public advocacy on health issues has always rested on their service—especially to women, children, the sick, the poor and the uninsured—and it continues to do so today. That record of service gave them a right to speak out. Ironically, the U.S. sisters’ civic leadership on health care reform marks a climax in their own history: a display of strength when the sisters are becoming aged and their numbers are decreasing. Today the church in the United States needs more young women, moved by the Spirit, to join religious life. A new generation of religious women still has a vital role to play in the flourishing of Catholic life in the United States. Their lifelong witness of prayer and service is needed to energize Catholic health care, Catholic education and Catholic justice ministry. They can be pioneers in the 21st century as their predecessors were in the 19th. In addition, more lay movements with a charism for healing ministry are needed, and more lay health professionals committed to sponsoring Catholic health institutions, especially those affiliated with the sisters’ congregations, can build on what the sisters have established—in hospice care, in prevention programs, in helping seniors (and others) navigate increasingly complex health systems, and in sustaining the nonprofit model of quality care driven by the compassion of Jesus the healer. The sisters’ extraordinary witness illustrates how huge a gap would be left were their numbers not replenished or their work not taken up by others. For the civic muscle the sisters brought to bear is a result of their lives of prayer, discipline and vows kept daily in service to the church. They have shown how powerful and authoritative Christian communities can be when they build credible institutions that serve the common good. If there was ever any doubt about the relevance of women religious to contemporary American life, the sisters’ role in health care should dispel it. What a beautiful tribute to these courageous and prophetic Sisters! Thank you to them and to the equally courageous Editorial Board of America. Unfortunately though, we are already hearing of seeming retribution for their actions by several diocesan Bishops. Let us pray for all involved that their (and our) actions may be truly based on the teachings of Jesus and not on our personal views. "First, their communities have been the focus of an ongoing Vatican investigation, the purpose of which has never been fully explained." Is the fact that the number of the number of women religious went from 179,954 in 1965 to 60,715 in 2009 not a good explanation for a concern on the part of the Holy See? Seminaries, colleges, universities and dioceses have all been investigated without incidence. Why this unwarranted, standoffish attitude? I applaud the sacrifices of the many sisters who continue to care for the sick, but - let's be honest - religious sisters are not called to be social workers. Social workers don't have to make a profession. A profession means more than a vague participation in a Christian enterprise. it's directed to a Church founded by Christ that has a visible hierarchy that He established. The sister's witness to Christ's true message is outstanding. They represent the true Church. The hierarchy has much to relearn and fortunately the sisters are pointing the way. First, regarding numbers: Please read Sister Sandra Schneiders's five-part series in the NCR on the history and development of religious life. Numbers do not tell the whole story! Second, regarding social workers: It is evident that you do not have a close association with contemporary religious women. They are "social workers" in the very best sense of the word - just as Christ was a "social worker" - saving real, suffering human beings by showing them they are of inestimable worth, by breaking down barriers that inhibit growth and evelopment, and by leading others to the love of God. Third, regarding profession: Vows are made to God, not to human beings, not to the church. The church is not the hierarchy, but the People of God. Christ NEVER established a "visible hierarchy" - you can thank Constantine for that. Religious women and women in the church are assessing the meaning of vocation in the 21st Century. Medieval norms do not apply. Women have the courage of their convictions and serve others without fanfare or hoopla. From the bishops, all I see are pampered men drunk with their own power walking in perfect lock-step wearing blinders that will never allow them to see the whole picture of contemporary life. Further, I believe that they prefer to live without seeing the reality around them. Looking at the human condition might require a real-world response from them. And which of them wants to soil his lace and satin robes, not to mention his gem encrusted ring and crosier, with the actual needs of the People of God? This article is oblivious to the fact of what's really at stake here. The lack of even mentioning the millions of lives of children that will be slaughtered as a result of this bill passing is tragic. Where are your minds and hearts? The sister's are at odds with the bishops of the Church. Let's be honest and not call evil good. These sisters need to be ashamed. No wonder their numbers are dwindling. God does not bless disobedience. They will not be missed. There is no question that the sisters have standing with respect to the health care bill. But have they read the entire bill. Are they aware of Comparative Effectiveness Research (CER) and its implications in the hands of the government? CER coupled with Quality Adjusted Life Years is the real danger. Did the good Sisters read about John Holdren, Cass Sunstein and Ezekiel Emanuel? We cannot make this decision based simply on some good feeling that it will give us. We need to look at all of the unintended consequences that will arise. Do the research. I did and it is not a good outcome for the unborn, the elderly or the disabled. Isn't the point of prudential judgment that it's something that one doesn't have to be in lockstep about? I think that the CHA and the sisters it represents made a tragic error that will lead to the deaths of many and not just over abortion. Socialized systems do not work and over the long haul they reduce the quality and amount of available care. The sisters' seeming ignorance of the plight of end stage socialized medical systems and how it hurts patient care is unfortunate. We *can* get to universal care but to do it sustainably we need a great deal of economic growth, growth that is hampered by the Obama administration's vision of health care reform. I hope and pray that we can do better moving forward. I'm not sure what is more unfortunate between your theological misunderstandings or your deep-seated animosity toward the pastors of the Church. I'm willing to admit that there are a lot of factors contributing toward to decline in the numbers of women religious - large among them being the abundant opportunies given to women in the current age that were not available to them in the 1950's. However, denying that there might be an internal problem is risking blindness. When I say a professed religious is not a social worker, I didn't intend to impune religious ministry or social workers. I meant to say that religious have a higher call based upon their profession. But along to your misunderstandings. To say that Christ did not form a "visible hierarchy" is to fall into one of the more common Protestant heresies. They were visible. And they had names: Peter, Andrew, James, John, etc. And they understood their mission to found "visible hierarchies" whereever they went by the appointment of bishops. And to say that religious sisters don't make "vows to men" is to obscure the meaning of religious profession, the Rite of which has the one being professed asking "to make perpetual profession in [the community] for the glory of God and the service of the Church." Of course, the profession is done in the context of the Holy Mass presided over by one of those "pampered men drunk with their own power walking in perfect lock-step wearing blinders." I am confident that I have had closer associations with religious sisters than you have with the pastors of the Church. Perhaps that's why I don't feel the need to disparage them. I am very sad for your prejudicial attitude toward the Church, called your "Mother" in the Solemn Blessing of the professed. Thank you, America, for this wonderful reminder of how much we owe to the prophetic witness of religious women in our church. I feel certain that when historians look back at this period in the life of the church in the U.S., they will rightly praise the courageous and faithful women who took the right moral path as the health care bill was passed. I am deeply grateful for the faithful witness of women religious and the Catholic Health Association in their support of a more inclusive and compassionate health care future in the U.S. I have worked side-by-side with many of these women religious for nearly ten years to extend health, wholeness, and human dignity to all who live in this country. I was moved to tears when I heard of their courageous letter to Congress in the final days of the debate, and believe that their actions were the turning point in the deliberations. As an ordained Protestant minister, I am honored to stand with them on this issue and any other that lifts up our sacred responsibility to work tirelessly on behalf of the common good. God bless you, Sisters in Faith and Witness! Like many other posters here I am so very proud of our sisters. They have built the church in America. They serve, humbly and without fanfare, the most marginalized people in our society. To TMLutes: Alas, this health reform bill is not socialized medicine. It will cover 30 or so more million people. It will evenutally contain costs that will ultimately benefit everyone, even those who think that they are not endangered by increased costs. Real "socialized medicine", like the many different versions is Europe, works very well. Those countries have outcomes much better than ours. They live longer and healthier lives. Again, the sisters give me hope that our church can withstand the arrogance and cluelessness of its current leaders in the Vatican and their yes-men bishops in this country. It is interesting that America chose a picture of sisters in habits for this article. One wonders how many of the sisters who supported health care legislation that did not have any provisions that specifically prohibited federal funding of abortion actually wear religious habits. God bless the sisters. They were a huge encouragement to me during the final days of the healthcare reform process (especially after the disappointing behavior of the bishops). The sisters represent the best in Catholicism. God bless them. I am grateful for your thoughtful, sensitive tribute to our sisters. It has been and is my privilege to minister with them and to have been both edified and instructed by them for nearly fifty years in both Catholic health and Catholic Charities activities at the local, state and national levels. They are human beings like all the rest of us with all that implies but as a group are professional and prayerful, reflective and action oriented.CHA meetings are a constant source of renewal and refreshment, more like a retreat than a trade orgnization meeting. Whether in formal Catholic Charities activities or in the myriad of grass roots, direct care activities at home and abroad they are the exemplars of what it is to be a Christian "social worker." How happy I am able to call them not only our sisters but my sisters. Certain sisters have staked their reputation on the cause of health care reform and lost because the fundamental right of the unborn child trumps the aid given to the needy. We simply may not sacrifice our unborn children on the altar of material gain, for the poor or for anyone else. And to challenge the leadership of the bishops in this area is to put the American Church on a collision course with Rome that will benefit neither the unborn child nor the poor. Regardless of what sisters have done in the past, the sisters who have spoken out in favor of the health care bill are wrong on this one, and their mistake will cause the deaths of millions of unborn children. Thank you Sr. Marilyn Wallace. The above article evinces an unusual mix of moral sensitivity and moral obtuseness. The scope of the contribution sisters have made to education and hospital care is one of the most underreported and underappreciated stories in American history. This brief essay outlines those tremendous contributions well. Yet then the editors go on to impugn the motive of the Vatican for basically doing an exploratory survey of groups of sisters in the US. The editors have on board Fr. Martin, who has a good theoretical business background. If any corporation, profit or non-profit, saw a 2/3 decline in membership/customers over a relatively short period of time in say an international division, could you imagine that corporation not sending some resources for an exploratory study in the area to visit the sites and find out what is going on? That is long overdue, don't you think? As far as the bishops taking a stand on not supporting a bill that permits the furthering of abortions in the US, I guess either you think abortion is ending a nascent human life or it is removing a tumor, a body part, from the mother's body. The bishops were bold and firm for life on the issue and had a real chance. The group of sisters that weighed in contrary to the bishops played a large part in undercutting this possibility. The signing pen given by President Obama is, among many other good things, sadly, also the signing pen of death warrants. That is a sad thing to even think. America rightly criticized the bishops for not adequately protecting the innocent young from sexual abuse. Now it's time to be coherent and give high praise to the bishops for doing all they could to protect the innocent young from extermination. It is sad that the good sisters did not insist on Single Payer. What they got for their efforts is a corporate give-a-way that will help few Americans. Please check the statement by Physicians for a National Health Program at www.pnhp.org. For those who keep throwing in the idea that there will be a mass number of abortions as a direct result of this healthcare reform I would recommend the article "Cul-de-Sac Catholicism" by Nicholas P Cafardi. These two writings (the one above on the sisters and Mr Cafardi's) go hand in hand. "Cul-de-Sac Catholicism" shows that abortions are not going to rise as a result of this legislation (in fact they will probably decrease). Something that I believe as well. I think it is a pretty cheap shot to say that all these sisters decided more abortions would be ok as a way to serve the poor (as some seem to be implying). Clearly that is not the case. The distressing narrative of this article by the editors depicting actions of some religious sisters in open defiance to our bishops further outlines the trajectory of liberals in the midst of the Holy Catholic Church whistling along to the tune of disobedience. That band has been playing together for about as long as the Rolling Stones with about as much moral clarity. How droll to frame the argument in 60s radical polarity: the powerful authority against the few, aged, and diminishing defenders of the poor. Only now, the tune isn’t quite so groovy, and the audience isn’t stoned. The teaching of the USCCB is clear: the healthcare bill, now law, was insufficient on a number of grounds most importantly on the fundamental protections for the innocents in the womb. I take exception to the editors lauding the sister’s actions as “a display of strength” which reveals their liberal bias. Not surprisingly an increasing number of Catholic hospitals which these sisters have been entrusted with risk losing their Catholic identity and thus lose the noble heritage of their founding. Obamacare hardly seems to me to be a vote for strengthening or restoring the vitality of these institutions, but appears to be another flagging wave of capitulation to the zeitgeist. What I find puzzling is the absence of any reference to the statements Carol Keehan made on the World Over with Raymond Arroyo on October 09, 2009 when she repeatedly gave her unequivocal support to the pro-life cause. Moreover she stated, “We have never worked at cross purposes with our Bishop’s Conferences.” What happened? Stupak happened, that is liberalism trumps the teachings of the Church and especially their teachers. I can only assume she either intentionally gave misleading statements to the public. Why doesn’t Sister Keehan explain the reason(s) for her about-face? I suspect no such public statements reconciling her actions will be given. Lastly, Archbishop Chaput remarks concerning the grave error and false w response to the sisters grave scandal as follows: worth underscoring: “…people who claim to be Catholic and then publicly undercut the teaching and leadership of their bishops spread confusion, cause grave damage to the believing community and give the illusion of moral cover to a version of health care “reform” that is not simply bad, but dangerous.” What would have been a courageous display of strength would have been Carol Keehan and her sort standing in solidarity with our Holy Church against the prevailing culture not give false witness to our Holy Catholic Faith. Sister Keehan and all the leaders who gave their support ought to resign their positions allowing a person whose principles are faithful to the Holy Catholic Church. To say that the wording of this bill does not potentially open the door to more, and taxpayer-funded abortions, is simply incorrect. Kathleen Parker has explained why. Briefly, public centers which provide reproductive services are entitled to provide all reproductive services, which they will define as elective abortion services, as they certainly will choose to do.The bishops' wording would have prevented that. Why do you think Planned Parenthood was elated and celebrating the wording of the bill? I'm sure Sr Keehan meant well when she and a group representing a distinct minority of sisters signed this bill, but with their signing they are responsible for undercutting the attempt our bishops made to have a health care bill without these future deaths attached to it. I read and responded to the cul-de-sac piece you referred to. Our bishops were already in a cul-de-sac for not adequately protecting innocent children from abuse. That they stood up to protect the innocent nascent children from extermination, not the easy or popular position to take, but rather a principled one, is one genuine step out of that cul-de-sac and back into the light of authenticity and following the gospel message of protecting the children-from death. To the best of my knowledge, neither Sr.Carol Keehan nor the various congregations concurring in her disagreement with the bishops tied their decision to the Vatican investigation. How do Pro-Lifers form a firing squad? Well, first they form a circle . . . The vilifying of the women religious who differed with the USCCB on an issue of legislative interpretation – not Church “teaching” – is counterproductive and unfair. And it is particularly unfair to cite Archbishop Chaput as a witness against the sisters. His Excellency, over the long haul, surely deserves credit for his vigilance on behalf of the Unborn (as well as the criminally condemned). But the health care debate was hardly his finest hour. Go to the web site for the Archdiocese of Denver. http://www.archden.org Read Archbishop Chaput’s columns from August and September 2009. Plainly, he did not feel any duty to be “on-message” with the USCCB. Hence his recent condemnation of women religious for breaking ranks and thus doing a “serious disservice to justice, to the Church, and to the ethical needs of the American people” smacks of a double standard. ). Furthermore, Planned Parenthood released a statement expressing disappointment with the Executive Order that they say, "...further codifies the proposed anti-choice language in the health care reform bill." All this is far from the rejoicing that you are thinking is taking place. This health care reform bill continues with the tradition of not allowing abortion funding to come from the federal government and if Planned Parenthood's statements are correct even goes a step further. On top of that I believe this bill is actually pro-life in that it provides assistance to needy women who are pregnant or with children. Additionally, did you realize that the bill provides funding for abstinence-only programs as a way to reduce unwanted pregnancies? Actually, the LCWR represents itself, not the thousands of members who were not asked whether they wanted to sign the statement of support for the health bill, nor the many thousands more who do not belong to LCWR member religious communities, but to those of the Council of Major Superiors of Women Religious. The LCWR communities are mostly dying, whereas the orthodox CMSWR communites are growing, some by leaps and bounds. The "witness" of the LCWR leaders who signed the letter of support, as well as Network and others, amply illustrate why their communities are dying. It is very fitting death thrall, not a sign of the relevance of these particular sisters. Thanks for bringing these resources to my attention, also your civility. It gets tough on this board sometimes. I would add a short phrase to your sentence above, that Planned Parenthood was clearly pleased that the health care reform passed shorn of the Stupak language that prohibited the funding of abortion....I think they were prudent enough not to look too overjoyed. If you are interested in another point of view you might check FRC Action's letter to the House dated March 18th; it points out 3 avenues that allow federal funding of elective abortions in the bill. It is written from a pro-life point of view. When I seek a neutral, reliable source, I often turn to Factcheck from Annenburg. They adressed this issue, and they concluded the bill would allow newly subsidized private plans to cover abortions, the subsidies coming of course from taxpayers' dollars. Given the circumstances and the life-death issue involved, I hope you are right and I am wrong. Thank you once again for your reply. Thanks to the sources you provided I have now spent a great deal of my morning staring at my computer reading postings from various websites. :) But I have to say that the more I read the more I feel certain that this legislation was pro-life and the sisters had it right. The first item that I looked up was FRC Action's letter to the House dated March 18th (I accidentally pulled up the one dated March 20th first which was about why Executive Orders are meaningless). I hope you noticed in the letter that in every case where they felt abortions might be covered something else has to happen first. Towards the end of the letter my mind had started to focus in on the amount of times the word "IF" was being used before every abortion funding statement. Example: "...IF the Hyde amendment were not renewed on the LHHS bill in a given year, abortion on demand would be funded..." FRC Action cannot simply point to something in the bill and say, look it provides for abortions. They have to go down a great many twisting narrow paths to get there. The second item that I looked up was the FactCheck.org article on the impact on abortions by this bill. As you have pointed out they are a neutral, reliable source. The specific article that I read can be found at: www.factcheck.org/2010/04/the-abortion-issue/. Throughout the entire article it kept repeating that this legislation does not provide Federal funding for abortions. The subsidies for private plans that you mentioned above does not cover abortions. A seperate private check would need to be written for that. And to be quite honest... I am a single woman in my lower 30s and even if I was ok with abortion would not consider paying extra money for coverage that I may never need. Especially since the average abortion only costs around $400 and what I would pay in insurance coverage would pass that mark pretty quickly. Lastly, I would like to draw your attention to the final paragraph in the FactCheck article. This paragraph reports what happened in Massachusetts under an almost identical health care bill. It reports that during the first year abortions actually decreased by 1.5 percent. And the most recent data shows that abortions are now at their lowest levels in Massachusetts since at least the 1970s. There is plently of reason for hope I believe. Thank you again for this conversation. One thing these material you have provided and I have discovered makes clear is how byzantine all this can get. In the case of the FRC letter, I don't think you have characterized it fully accurately. Their first and strongest issue, for example, contains no ifs and or buts: "Section 1303 (p. 2069) of the Senate bill would spend taxpayer money to purchase plans in the Exchange that cover elective abortion, a subsidy for abortion that directly conflicts with the principles of the Hyde amendment." It goes on to further explain the position. Also, it is true that the letter refers to 2 "ifs" on other points. If you follow those points, they serve as a roadmap of steps that could be taken to circumvent restrictions on using public funds for abortion and/or to make it more difficult for the states to opt out of funding elective abortion. It is reasonable to suspect that these possiblilities were made available to for just those purposes by those crafting the bill. The main points of the section of factcheck you referred me to, as I understand what they wrote, were that there will likely be no great increase in abortions as a result of this bill (they admit to having no crystal ball) and that the executive order of President Obama will counter any attempt to use federal funds for elective abortions. One positive aspect, I hope we can all agree, is that some uninsured young women will have easier access to prenatal care than they presently have, and I hope that this will result in fewer abortions, as apparently many believe. Also factcheck notes that elective abortions have been coming down for some time in the US. My suspicion here is that prolife campaigns have had a positive impact on this issue, and also that the improved quality and availability of sonograms have made it clear to expectant mothers just what they are choosing should they abort. I do believe that President Obama's track record on living up to his word is suspect (8 campaign commitments to open up the health care debate on Cspan for all to see; behind closed doors plan instead; a commitment not to use private campaign funds to buy the election; a change of heart when he saw he could get the largest amount of campaign funds; and then a switch back against corporate contributions when it likely would mean a disadvantage to his party):his modus operandi seems to be expediency above all. So I am skeptical on relying on the constancy of his commitment here. But we will know soon enough if the bishops were correct or not. A petition to repeal the health care law can be found at www.revereamerica.org. That is revere as in Paul Revere. I was proud to stand with all of the women who supported the Healthcare Bill, both my sisters in religious communities and those who life vocations have taken them to ministry in other life choices. And yes, retaliation aganinst those supporting its passage has already begun from members of the hierarchy like Archbishop Chaput. But have no fear, retaliation is yet another tool of the weak, the despot and the oppressor who say one thing and do another. I am proud to say I am Pro-Life, but I am Pro-Life across the board and not selectively as some many members of the hierarchy are. Why is it that someone like Chaput in Denver, or for that matter, Rigali in Philadelphia, Mansell in Hartford etc., etc., profess to be Pro-Life but consistantly oppose STATUTE OF LIMITATION REFORM in regard to the sexual abuse of children, all children? Are children in the future not to be protected by adequate laws against the sexual abuse of children in all our states? Are the now adult victims of sexual abuse by priests, ministers or doctors in the past to be denied the justice they are entitled to as citizens of this country because church officials did not report what they knew in a timely fashion? In a recent press release from the Holy See, "concerning cases of the sexual abuse of minors in ecclesiastical institutions," Director Fr. Federico Lombardi repeats some of the more clichéd responses and predictable excuses to the church's ever widening problems of sexual abuse, particularly the sexual abuse of minor children. Contrary to what Lombardi says in the press release from the Vatican, the institutional Roman Catholic Church has reacted to the continuing sexual abuse debacle neither rapidly nor decisively and the Vatican continues to distance itself from what has happened in country after country, first categorizing it as an "American problem," then as a "homosexual problem" in the United States in 2002. The church's response continues to be reactive rather than proactive while minimizing the systemic and endemic abuse of power and authority which enabled and exacerbated it on the one hand while covering it up whenever and wherever possible on the other. The "wide-ranging context" that Lombardi speaks of is that in countries from the United States, Canada, Australia and Ireland to Austria, the Netherlands and Germany, church authorities have repeatedly and consistently disregarded the institution's own moral and Canon laws as well as the existing laws of the countries' in which these horrific crimes against humanity took place. The church has lost its way. If church authorities had done the morally right thing initially, one wonders how many children would have escaped being sexually abused by a particular priest? "The Roman Catholic Church has the largest body of knowledge of non-incarcerated sexual offenders in the world." Who, one has to ask, would have more knowledge of the internal machinations utilized to cover-up and protect sexual predators from public scrutiny than Pope Benedict in his former position as Head of the Holy Office? While attacks on any individual is regrettable and counter productive, the fact is that Pope Benedict XVI is at the helm of the Barque of Peter. His challenge is to see that current church policy agrees with his statements in something as significant as the recent pastoral letter to Ireland. What was done by church leadership in the United States, for example, were actions they were forced to take by the pressure of public opinion after records, files and correspondence were forced into the public venue in 2002 by Judge Constance M. Sweeney, a very brave, grounded and principled Catholic woman of Boston, Massachusetts. As the facts show, the bishops of the United States at that time were forced to make the decisions they made even while powerful bishops resisted calls to accountability and transparency every step of the way. Moreover, while Benedict has accepted two of the proffered resignations from the Irish bishops it is well to recall that not one bishop in the United States was removed from office because of his own complicity and collusion in covering up sexual abuse. Nor has anyone been forced to resign for violating then existing canon law, criminal law or civil law. Bishops in the United States like Bernard Cardinal Law and his auxiliaries in Boston, who were shown to have been complicit in protecting known sexual predators, should have been removed from office, their resignations tendered instead of being rewarded with a plum position in Rome in the case of Law, or their own dioceses as has been the cases with complicit Boston auxiliary bishops. Sadly there are also examples of state authorities making deals with bishops that avoided any kind of prosecution, even though some had to admit guilt to get the deal. In a shameless act of pure hubris, the bishops specifically chose not to hold themselves to the same standards of accountability they drew up for ordinary priests. When are people of good will going to say, enough! When are state legislators going to change the laws so that justice can be pursued for the thousands upon thousands of victims of childhood sexual abuse who have been unable to access let alone obtain justice? In most states and probably in most countries, existing criminal as well as civil laws give more protection to sexual predators and their enablers then they do to victims of childhood sexual abuse by anyone. The problems with statutes of limitation which have expired are probably much the same in Germany and other European countries as they have been is in so many jurisdictions in the United States. This is deplorable and should not be the case. The removal of all statutes of limitation in regard to the sexual abuse of children is the single, most effective way to hold predators and enabling institutions accountable before the law. More than that, window legislation allows a set time frame for previously time barred cases of sexual abuse by anyone. It is possible to change the laws in order to give some semblance of justice to those ravaged at so tender an age. What is needed to effect that change is the will to hold all sexual predators of children accountable along with any enabling individuals or institutions. The state of Delaware is one of a very few number of states in the United States which has removed all criminal and civil statutes of limitation in regard to the sexual abuse of children by anyone. It also legislated a two year civil window for previously time barred cases, again, by anyone. That window closed in July of 2009. Delaware also has a civil registry for those judged responsible under civil statutes. In a civil suit, unlike a criminal suit, the burden of proof that any sexual abuse took place is on the plaintiff. The burden is not on the accused individual or institution to prove innocence, at least not in the United States. Every victim of childhood sexual abuse should have a right to the pursuit of justice at the very least! What people seem to forget is that children’s rights are human rights, that children’s rights are civil rights and that the hierarchy, the leadership of the Roman Catholic Church, has violated those children’s rights in the most profane of ways, not only by covering up for sexual abusers, mostly priests, but also by enabling the further abuse of untold numbers of children by these particular individuals who were known to be dangerous predators. If Delaware can do it other states and other countries should be able to do it as well, and hold sexual predators and any enabling institutions responsible, especially when those institutions choose to ignore their own internal laws. I was privileged to testify before the Senate and House Judiciary Committees in support of the 2007 Child Victims Law in Delaware. No rules and no laws of any religious organization or denomination should be allowed to trump the laws of a civilized society where the protection of children is concerned. Not only should the institutional Roman Catholic Church be held to the highest standard as a signatory to the United Nations Convention on the Rights of the Child, it should be leading by example and showing what can and should be done to protect children from sexual exploitation, from what really is another example of trafficking in individuals for purposes of sexual exploitation, nothing less. By any objective standard the church has grossly violated the U.N. Convention on the Rights of the Child for decades. Is it time to formalize those violations as the crimes against humanity they truly are? 1) medical care in this country is corrupt (I am NOT calling everyone "corrupt"). Mother Joseph's going to the miners and lumberjacks on a donkey to "beg for alms" all by herself-not impersonally sitting behind a desk writing emails and telephoning (to reach more people?)... without governmental grants nor subsudies telling her what to do, were the reasons for the "Christ-like" care given: it is the "personal touch". 2) there is no need to worry because we are all going to be dirt-poor and even without the basic "amenities" of life... we are going to learn to do things simply and in concert with others... (the result of this economic disaster now even more close because of the spending this bill involves). Was this the reason for the support of this bill? Never mind there will be billions of deaths... the "green" sisters know well the implications of over-spending. 3) in the face of the collapse now upon us, we will be less concerned with our medicines (no one will be able to afford them)... less concerned with our aches and pains (we will be too busy working for survival)... and less dependent on a government-which will not be there... (again, at the expense of billions of deaths). 4) where will all these dead (the elderly and disabled) be buried? will their corpses "be open in the forest"-like in India currently? Perhaps the sisters would do better to invest in cemeteries! After all, we Catholics bury our dead! I see the universal "healthcare" as only a deepening and broadening of the disaster medical care has both perpetrated and become... the sisters have lost their original pioneering spirit, and independence from coersion. They, too, have fallen into the traps presented by "bureaucracy". Why do we not know about history-and the reasons for the rise and fall of Empire? Now, no longer teaching history or nursing-they seem to be "taken in"... and most not actively participating in the lives of "average American Catholics" (except, perhaps their families-most not "average"). Instead the degree of education they possess (higher than women anywhere in the world) has left them "above the fray" of reality-as well as teachings of the Magisterium they do not obey nor believe (here, again, I am not talking about all of them). They DO need to listen to the "cloistered nuns" as well as those among them dissenting about their direction and "mission." In fact, we all need to be listening more deeply to each other... taking the time to do so has become a "lost art". The need for spiritual directors who are knowledgeable about the spiritual journey (now left to so many laypeople who do not embrace "tradition", and are "out on a limb" theologically)... a very demanding and "tough" business, is a much better "mission". This has saved my life and made me a better Catholic! medical care was a near-death experience. Listen to the sisters who spend their lives contemplating the "face of Christ". Poverty is an important vow! (it does not simply mean "sharing all between each other"). I do not feel it is necessary to take this slide into anarchy to "fix" the problems; all the solutions are in the Church "depository of faith". Let's not do it "my way"-let's do it Christ's way! I am a thirty-year veteran psych nurse with a graduate education in clinical psychology/healed from the ravages of early-infancy extending to adolescence sexual abuse through the wise spiritual director of a Sister of Providence and the Church. Everyone's journey, of course, is unique... and while I cannot prescribe for each a "way" (other than Christ, "the way; the truth and the life.") I CAN say with certainty, that limiting the healing of Christ (by saying "sexual abuse effects last a lifetime"; "there will never be anything but emptiness", etc.) is doing the REAL damage to these "spiritually-assaulted" persons. Putting the divinely-created human brain (capable of complete transformation free of previous life-experience, chemical "imbalance"-non-scientific and wrongful claim, or even massive brain injury, now proven in "neuroplastic research") on medicines that only clog-up the transformative process (disorganization and anger before such profound change is norm), these medicines, along with "incurable" dx have made people "illness"... as their human identities and dignity are robbed. Happening on a massive scale now, biological psychiatry has destroyed our spiritual underpinnings. Since, in many of these sisters' hospitals, psychiatric care involving ECT and forced or coercised medicating of this nature is occurring... where it is, they are complicitous with "torture" (as UN defined and declared)-the actual reason so many will not consent to "treatment". The hundreds of thousands of people on the streets with these monikers are testament to the failure of biological psychiatry. I personally believe our lack of faith that those sexually-abused can heal is also due to the same. Of course, this is simplification of a complex picture-but it is highly-contributory. "Father, forgive them, for they know not what they do"... I myself, was complicitious in this as well! If you are disbelieving-you need to check out the hundreds of websites/agencies battling with this all over. Sr. Maureen Turlish makes the valid point that no religious organization should be allowed to trump the laws of a civilized society when the protection of children are concerned. (The confidence of the confessional would deserve special consideration in this case, perhaps.) I believe she is right on in this regard, that a crime is a crime, these priests should have been prosecuted, before being forgiven or counseled or transferred, and that the opinion of the bishops' psychologists or their idea of mercy or second chance contradicted the larger issue of protection of the children. Yet the state in America has itself contributed to the problem with the fictitious construction of a "wall of separation between church and state," which exists primarily in a letter from Jefferson on a very limited and specific issue that has been wildly distorted and expanded. Likewise, protecting the weak and innocent inner-city children from being robbed of an education by denying vouchers to help them escape their sometimes disgraceful neighborhood public schools is a case where the law attempts to circumvent the protection of the children to receive the right of a decent education. And of course all this is doubly true in the question of the extermination of the unborn. The pederastic priests should be facing charges, not transfers. The citizens where the schools have been disgraceful for decades should be given vouchers, not condemned to chronically failed schools. And implied by Sister Turlish's statement, when a law is pagan rather than representative of a civilized society, such as the practice common to pagan societies which tolerated massive elective infanticide in its various forms, promoting the extermination of the unborn, it should be opposed by the civilized, not supported. We are a diverse nation, but we were and are founded largely on Judeao-Christian, not Spartan, values. The bishops being wrong on the first of these issues, as Sister has argued, even while right on the last two, is simply not good enough. It's sad to read the latest installment of America Magazine's ongoing betrayal of Catholic principles. These apostate nuns are not the corageous sisters, dressed in habit, who nursed the sick in previous generations. They are now feminist political activists who relentlessly pursue a socialist political agenda fundamentally at odds with the Catholic faith, and often openly heretical. Only Jesuits who are equally blinded by their own liberalism could fail to miss that point. The call that the editors make for more "vocations" to the apostasy of these orders is futile. Religious orders contaminated by heresy and liberal thinking inevitably die - it is an iron law of history that no quantity of ink spilled in a magazine can possibly overcome. These corrupted orders will continue their inevitable slide into obscurity, and hopefully they will soon be excommunicated. The continuing tolerance of dissent against Church teaching is not an enlightened liberalism, no matter how much certain people try to spin it, but rather a failure to carry out the duties that authorities have to protect the faithful, and even the heretic herself, from the deadly effects of sin and doctrinal error. You are to be commended for your editorial in the April 26 issue. The religious women and organizations who made public announcements in support of the health care law were more courageous than many may have realized. The contrary opinion expressed by the bishops put the women’s opinions in a spotlight that they may not have originally anticipated but, strengthened by the Spirit, they did not retract. Convinced that they were correct they held fast to their position but without attempting to enter into a debate with the bishops. Some bishops entered into the fray by castigating the women religious for having the audacity to disagree with the bishops’ opinion on the interpretation of a civil law and its perceived possible consequences. Some bishops accused them of “confusing” the faithful. I think today’s faithful are too sophisticated to be so easily confused by a disagreement such as this but for those who are confused I question where the blame should fall. If the bishops express one opinion and a respectable group of religious express an opposing opinion, does it necessarily follow that it is the latter who are causing the confusion? I applaud America for bringing some common sense to the health care discussion, and the courage to take on the American bishops and there vitrioloc propoganda against the sisters. I wish these bishops had been as earnest about routing out the child abusers among priests. We might have had fewer abusers and victims. And I wish they had spoken out so strongly against war. We might have had fewer deaths of innocent people. Instead, they choose to spend their energy villifying nuns who serve the disengranchised poor, just because they speak their conscience and don't submit to the bishops' rhetoric. It's bad enough that women are barred from being priests of bishops. Can't they at least be allowed to speak their minds without being castigated as heritics? What a beautiful, well-deserved tribute to these wonderful sisters! It is long overdue. I went to a college founded by the Sisters of Mercy and I met many wonderful, smart, educated, intelligent, hard-working, and dedicated nuns. In my opinion, the Catholic Church does not show enough appreciation for the nuns in the Church and all the hard work they do. 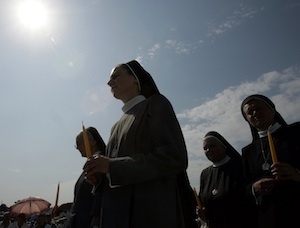 Nuns are taken for granted and treated as second-class citizens when compared to priests. Last year the pope declared the Year of the Priest. That's great, how about next year being the Year of the Nun!!! This article also appeared in print, under the headline "The Sisters' Witness," in the April 26, 2010 issue.